An ugly, outdated and closed-in 1950's galley kitchen is completely renovated when an interior wall and crummy cabinets get demolished. Along the way, the House Crashers team discovers many unwanted surprises that result in total chaos. In the end, new tile floors, sleek appliances, granite countertops and an onyx bar for entertaining make this the ultimate kitchen overhaul. 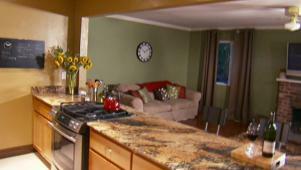 Tile floors, granite counters and an onyx bar add style to this kitchen.